After losing his job, Lee Kravitz--a man who had always worked too hard and too much--took stock of his life and decided to spend an entire year making amends and reconnecting with the people and parts of himself he had neglected. Kravitz embarks on ten journeys, traveling everywhere from a refugee camp in Kenya to a monastery in California, and learning along the way that the things we let slip are exactly those that have the power to transform, enrich, enlarge, and complete us." Unfinished Business" has prompted multiple speaking engagements, a blog on the "Psychology Today" Web site, and a groundswell of interest from readers sharing their own stories--the best of which are included in this paperback edition as further inspiration. Visit www.myunfinishedbusiness.com for reading guides and much more. Lee Kravitz grew up in Cleveland, Ohio, and attended Yale and Columbia universities. An award-winning journalist, he most recently was editor in chief of "Parade magazine." 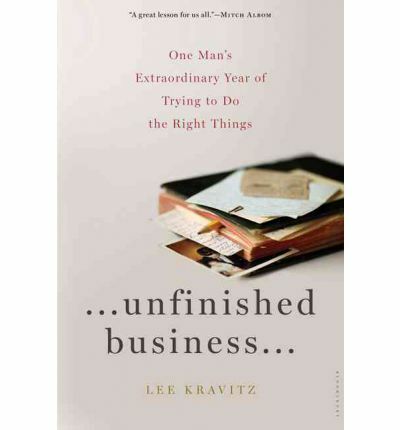 He lives in New York City and Clinton Corners, New York, with his wife and three children.Praise for "Unfinished Business" "Kravitz writes with an inspiring sincerity. His experiences are so familiar that it would be hard for readers not to reflect on their own unfinished business--and want to tend to it." --"Washington Post" "Kravitz used losing his job as a springboard to the human things he should have done. In so doing, he turned bad into bountiful. A great lesson for us all." --Mitch Albom, author of "Have a Little Faith"